One of Hadoop’s key features is its implementation of a distributed file system. A distributed file system offers a logical file system that is implemented over a cluster of machines rather than on a single machine. Additional details on HDFS are available on the Apache Hadoop website. Hadoop offers access to HDFS through a command line interface. 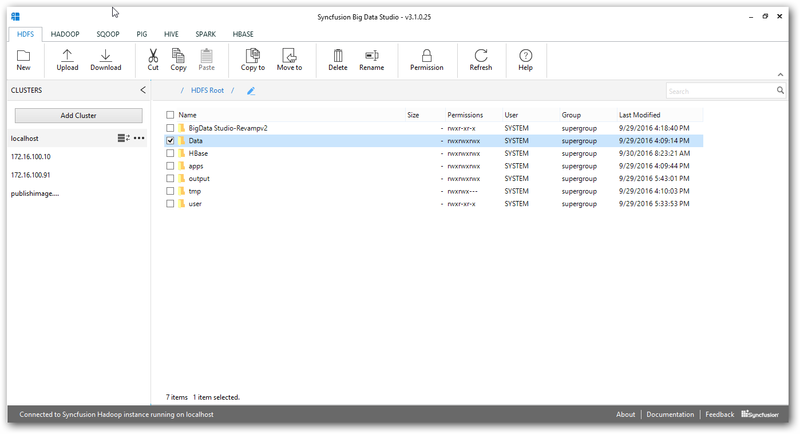 The Syncfusion Big Data Studio offers Windows Explorer-like access to HDFS. It allows for common tasks such as folder and file management to be performed interactively. Create new file - Click New button in the HDFS tab, Enter the name of the file and click Create button in the prompt box opened to create a new HDFS file. 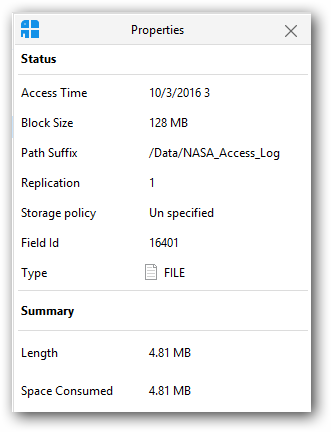 Upload files/folder - You can upload files / folder from your local file system to HDFS by clicking the Upload button in the HDFS tab. In the prompt select file or folder and then browse for the same and click upload. Set Permission - Click Permission option in the HDFS tab, a popup window will be displayed. In the popup window change the mode of permission and click change button to set the permission for files in the HDFS. Copy - Select the file / folder from HDFS directory and click Copy button in the HDFS tab, in the prompt displayed, enter / browse for target directory and click Copy button to copy the selected HDFS item. Move - Select the file / folder from HDFS directory and click Move button in the HDFS tab, in the prompt displayed, enter / browse for target directory and click Move button to move the selected HDFS item. Rename - Select the file / folder from the HDFS directory and click Rename button in the HDFS tab, enter the new name and click Apply to rename in the HDFS. Delete - Select the file / folder from the HDFS directory and click Delete to perform delete operation. Drag and Drop - Select the file / folder from the HDFS directory and drag it to another folder in the HDFS directory / Windows explorer and vice versa. 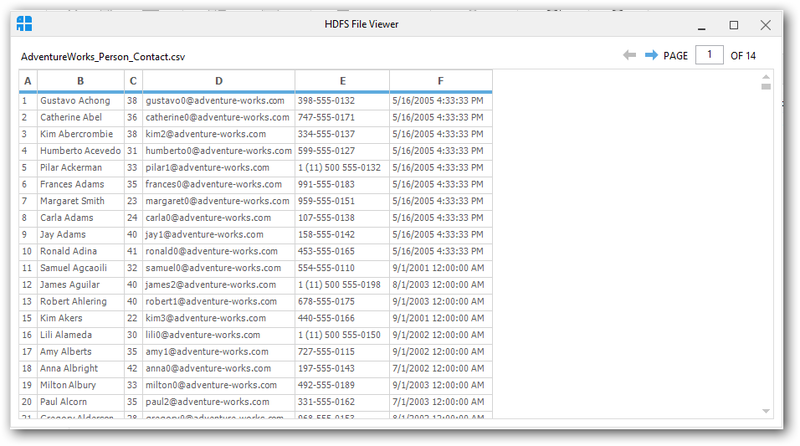 HDFS File viewer – you can view the content of the HDFS files directly by double clicking the file. 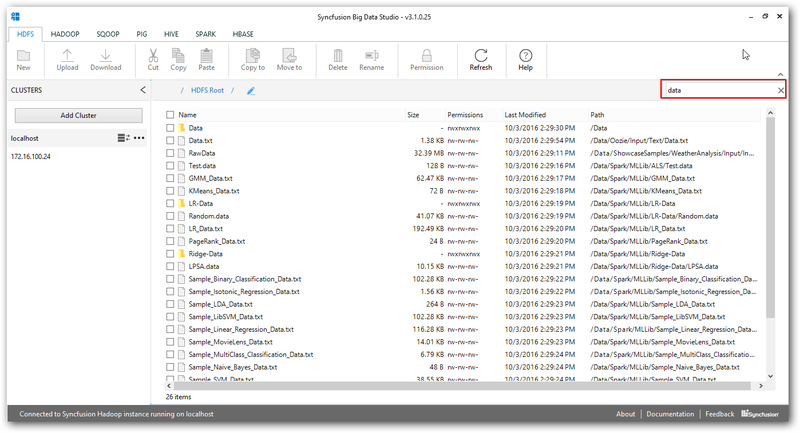 File contents are displayed in HDFS file viewer as like in below screenshot. 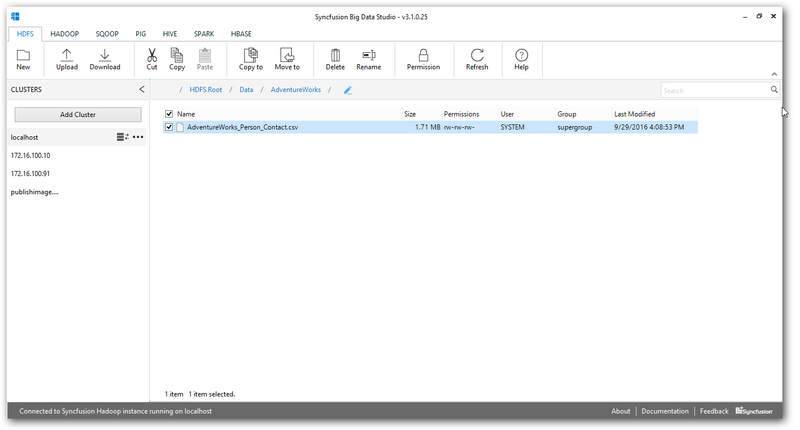 Search - You can search for files or folders in the HDFS file explorer as like windows file explorer. Below screenshot represents the search results for data. 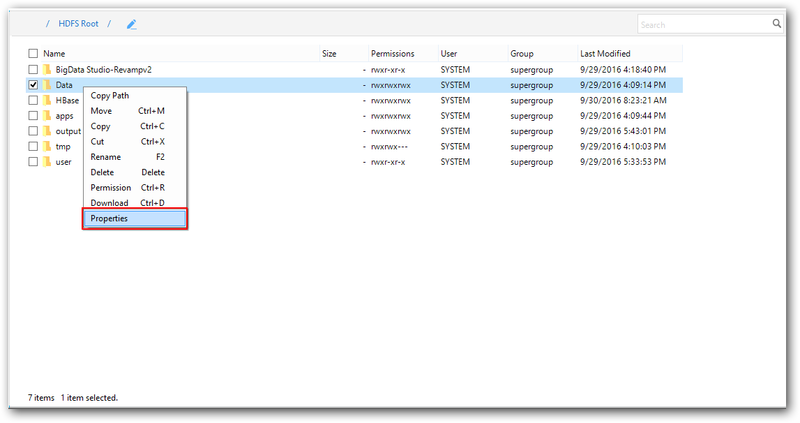 HDFS File/Folder Properties – Select the file or folder in HDFS directory, right click to get the context menu and then click “Properties” option to view its properties. Azure based Hadoop Cluster now supports Azure blob storage as default File System, with it you can easily scale the storage as well as you can easily switch between hot and cool access tiers at run time depending upon the processing needs. 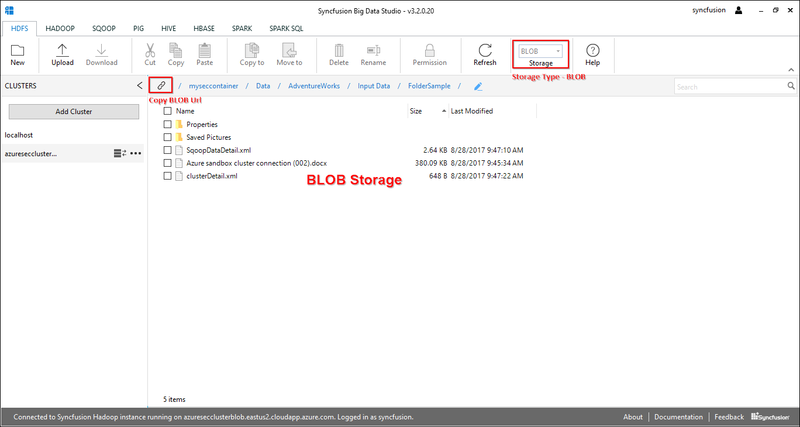 You can easily manage Azure Blob Storage when connected with the Azure cluster configured with Blob Storage from Big Data Studio. Azure Blob Explorer supports all the basic operations such as Copy, move, upload and download. Azure Blob Explorer also supports the copy blob url. We couldn’t create empty folder in Blob. We can create virtual folder only in Blob. 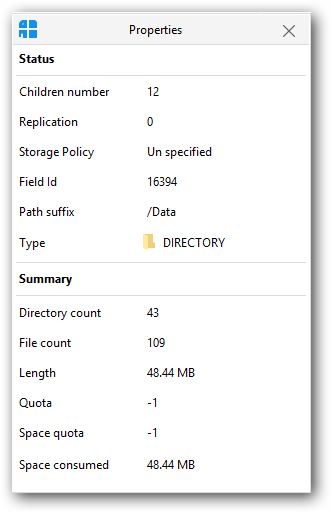 There is no support to set the permission for Blob directory/file.